Our report on Maintaining Scotland's roads: a follow-up report was published in August 2016. 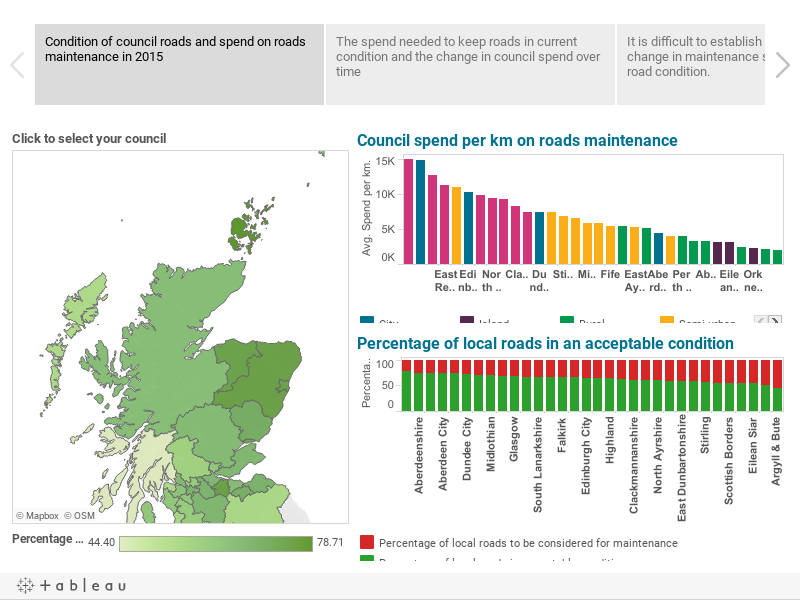 This interactive graphic illustrates the condition and state of trunk and local roads in Scotland. The data used for councils' road maintenance is produced by the Society of Chief Officers of Transportation Scotland (SCOTS) and is used throughout our report. The data on the performance of the trunk road operators is published through Transport Scotland’s Performance Audit Group’s (PAGplus) annual reports. North East - the contract was awarded to BEAR in August 2014, which also delivered the previous contract from 2007 to 2014. North West – the contract was awarded to BEAR in April 2013. The previous contract was delivered by Scotland TranServ between 2006 and 2013. South East – the contract was awarded to Amey in August 2014. The previous contract was delivered by BEAR from 2007 to 2014. South West – the contract was awarded to Scotland TranServ in April 2013, which also delivered the previous contract from 2006 to 2013. The trunk road information is provided by Transport Scotland. If you click on a council on the map the data presented will be for that council only. Clicking on a category in any of the graphs or keys will show only the councils that category applies to. To clear selections click on any white space in the graph you used as a filter. Drop down menus let you select different filters.